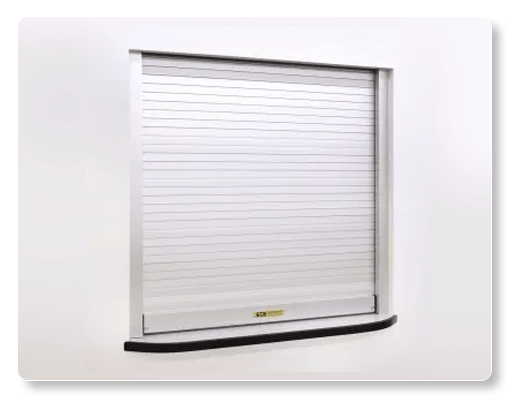 Rolling Counter Shutters – Wayne Dalton – Model 500 is an aesthetically pleasing and exceptionally secure solution for smaller openings. Engineered to be utilized in areas where counter tops or openings require the shutter to rest on a sill. Offering several different modes of operation including lift-up, awning crank and motorized, the Model 500 is the ideal solution for your concession stand, accounts payable window, arena or school cafeteria. Premium quality, interlocking slats on the shutter are available in galvanized steel, stainless steel or aluminum for maximum durability. The box type guides are engineered to reduce operational noise in addition to concealing the fasteners used to attach the shutter to the jamb. This results in quieter operation and greater visual aesthetics. Door’s counterbalance assembly contains a spring barrel which serves as load-carrying beam. Oil-treated, torsion-type counterbalance springs are created from heat-treated steel, reinforcing accuracy in balancing the door. Galvanized steel bottom bar is fitted with a continuous vinyl bumper to preserve and protect the counter top.